We hardly ever get together without mentioning you and our wonderful trip. 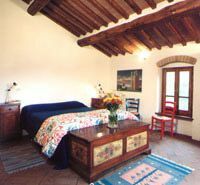 Barb P.
Elegant, cozy, and distinctive, this Villa in Umbria has been lovingly restored, retaining its original charm and adding the most modern comfort, amenities, and convenience. When you come up the road, you will see a place that could be on the front cover of "House Beautiful." Surrounded by dramatic terraces and artist-designed gardens, the house sits on a hill with views of a peaceful countryside-farmhouses, vineyards, olive groves, woodland edged with wildflowers, and rich pastures. This villa is a personal house, with a special charm and lots of room for you to feel the peace and pleasure of your Italian adventure. 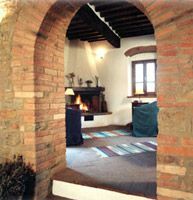 To learn more about this lovely villa contact Italian Travel Coach, Ginger Pozzini. Photos below from James R. Kaspar of JRK Images. The interior is lovingly restored and features traditional handcrafted furniture. The villa has two-zone central heating, double-glazed windows with pulldown screens on all windows for summer comfort. One of the highlights of their week was having friends visit from Switzerland and enjoy a dinner together prepared by local chefs. Situated on two floors, there are 3 double bedrooms: one with queen-sized bed, two with 2 single beds that can combined into double beds and a sitting room/bedroom with double sofa bed. 2-1/2 bath. The villa features a large, excellently equipped family-style country kitchen opening directly onto a terrace, for indoor or outdoor dining with an enchanting view. 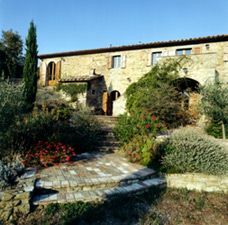 This hilltop villa is private but close to all the things you need to make your stay in Italy pleasant and enriching. Art and spiritual journeys are part of the joy of this region. From the house, you can easily reach world-famous art cities featuring works of Piero della Francesca - Arezzo, Perugia, Sansepolcro, and Monterchi-and works of Giotto in Assisi. 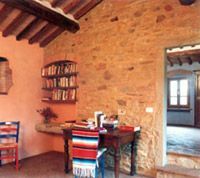 From the house, you can visit all of the major Franciscan pilgramage sites as well as a score of Umbrian and Tuscan hill towns-Cortona, Perugia, Gubbio, Montone, Siena. Most are close by, and none is more than an hour and a half away.